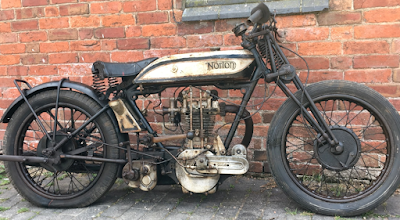 -JdK- This Norton was recently found in the UK. Simon: "It's a bit of a conglomeration of vintage parts but with a bit of a tidy up, it could be very usable. The engine number 297XX originally belonged to a Model 18 with frame 230XX which was despatched in April '26 to a dealer called Tom Davies. He sold it later in the month to a chap called Barlow, whose address is illegible. I have not spent hours looking for the frame number 123XX (they are not in numerical order in the records) but am pretty sure it dates from early '25. There are a few surviving flat tank Nortons with a saddle tank like this one. Such tanks seem not to have been supplied by the factory but as an aftermarket accessory by some enterprising company. As regards the rest of the bike, in no order of importance, it has been fitted with wired on 19 inch tyres, the oil pump is Pilgrim instead of Best and Lloyd and the rear brake pedal and rear engine plates are '29/'30. The spacers to carry the footrests are missing as are the footrests. The rear brake is also '29/30, hence the Heath Robinson arrangement to provide an anchorage for it. The primary chain case is not Norton - I think it's BSA but am far from sure. The carb looks like a 1929 Amal and the magneto almost veteran; not sure what it is. The magneto platform/front engine plates are also '29/30 and the front wheel (Horton) could be '28 to'30." PS. Simon's curiosity finally overcame him and he spent a good while seeking a Model 18 with the frame number 123XX. Perseverance paid off and it turned out to be the frame of a standard Model 18 despatched in mid July 1924. No final customer details are shown but the dealer is shown as Hassall - which we believe to be connected with the Hassall family members who worked for Nortons in the early twenties. PPS. 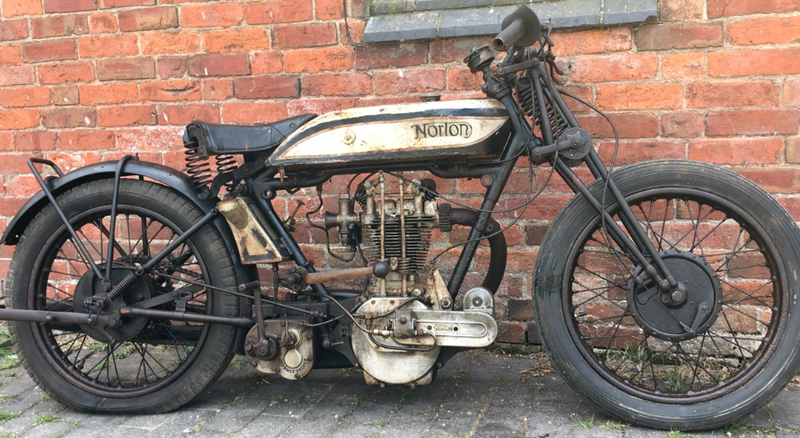 Just heard this bike is in Bonhams Stafford sale in October listed as a '1924 Norton.' While it would make a good project to get up and running as it is, it's a very long way from 1924 spec. and if bidders are aware of this it may make for a sensible sale price. Personally, I think it should stay as a Vintage Norton Model 18 Special!